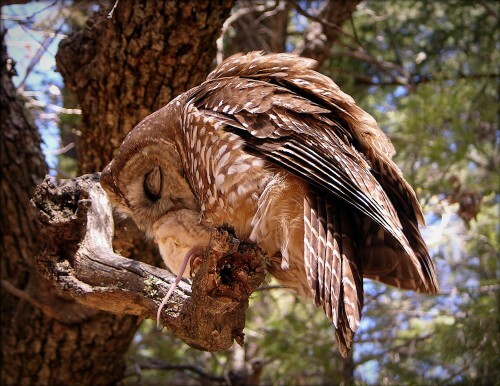 Mexican Spotted Owl Monitoring Continues in the Gila National Forest /Hawks Aloft Inc. In 2014, Hawks Aloft, Inc. conducted its second, non-consecutive year of Mexican Spotted Owl (Strix occidentalis lucida) monitoring within the Gila National Forest. The species was listed as a threatened subspecies by the US Fish and Wildlife Service in 1993. Field work began in late March with presence-absence surveys targeting nine historic Physical Activity Centers (PACS) where the reclusive owl had been documented on the forest in previous survey-years. Six of the PACs were located in the Gila’s spectacular Pinos Altos Range, a high elevation landscape of mixed-conifer/oak woodlands, just ten miles north of Silver City, New Mexico. This range remains important to the region, both as a recreational destination for nearby residents, and as one of the few remaining landscape-scale patches of ponderosa pine and spruce-fir forest in the Gila region that hasn’t suffered major drought-related, catastrophic, stand-replacement fires in recent years. The three remaining PACs monitored were located in the Gila’s Black Range, a north-south string of high-elevation habitat on the eastern side of the forest that separates the Mimbres watershed on the range’s west side from the Rio Grande watershed to the east. In 2013, the Silver Fire raced through the Black Range, burning 138,705 acres and leaving all three PACs at least somewhat affected by low to moderate intensity burns. Initial surveys in late March and early April confirmed that eight of the nine PACS targeted were occupied by Mexican Spotted Owls. Breeding pairs were quickly confirmed in all six of the PACs within the Pinos Altos Range and in two of the three PACs in the Black Range. Subsequent visits throughout April quickly revealed that the 2014 breeding season was going to be much different than the 2012 season, when most confirmed pairs either suffered early-season nest failure or chose to reproductively skip (i.e. not attempt to breed), probably due to the severity of the drought prior to the 2012 breeding season and the likelihood of a diminished prey base. In 2012, only one pair was confirmed as successful breeders, fledging two owlets in late June. By the end of April, 2014, nests were located for all eight breeding pairs. They were found either visually in pre-determined roost areas, or found with the help of mousing, where the male was offered live mice and later seen delivering the mice to a waiting female at the nest location. Throughout the remainder of the spring and early summer, all eight nests were monitored to known outcomes. Three nests failed and an additional nest was lost on Mother’s Day, when the human caused Signal Fire ignited on the north slope of Signal Peak, eventually burning 5,484 acres in the Pinos Altos Range. 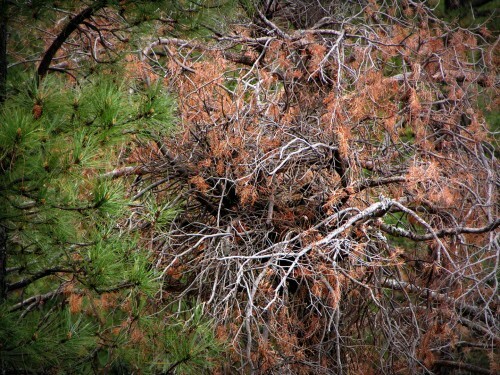 Unfortunately, the recently hatched nest that burned was located in an area that had experienced high intensity fire behavior as a result of high velocity winds and most of the PACs suitable habitat was lost, displacing the pair. The remaining four nests, three in the Pinos Altos Range, and one in the Black Range were successful, fledging a total of six young. Although drought conditions remained severe through the spring and early summer of 2014, heavy rains in September of 2013 may have created conditions more suitable for breeding. Importantly, regardless of breeding success, the Gila National Forest, based on our limited surveys in both 2012 and 2014, appears to remain a stronghold for the federally threatened Mexican Spotted Owls that, despite its reclusiveness, has a tenuous hold on its existence. This article originally appeared in the 2014 edition of Aloft.